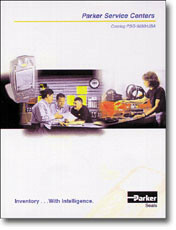 Irvine, Calif.-based Parker Hannifin’s Seal Group announces the release of “Parker Service Centers,?? a new catalog describing the network of company facilities that provide local inventory and order entry for engineered sealing solutions. The catalog explains how the centers increase customers’ profitability by reducing transaction costs and managing “inventory with intelligence.?? A special section in the catalog discusses the benefits of local, virtual and supplier-managed inventory programs via the centers.